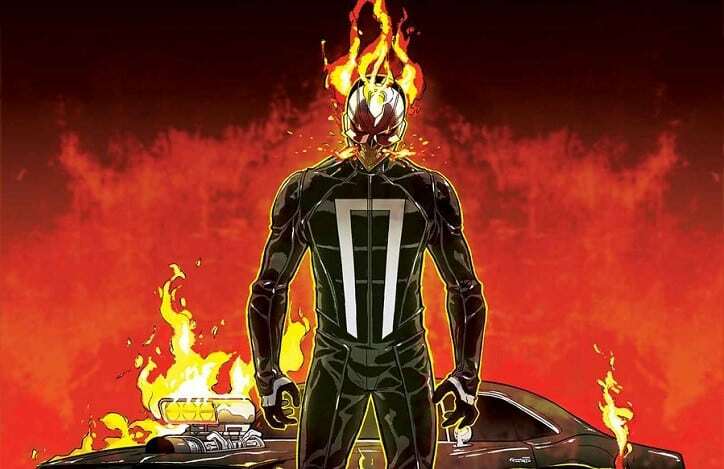 The first look at Ghost Rider in Agents of S.H.I.E.L.D. has been revealed, sadly not in flaming skull form however. Alongside this image, the first episode of Agents of S.H.I.E.L.D.‘s fourth season has had its title revealed. While no synopsis for the episode was released alongside it, the title seems to hint at an early appearance of the highly anticipated character. The image below shows Gabriel Luna suited up in a costume very reminiscent of his comic book counterpart’s costume. The premiere is titled “The Ghost,” and as ‘Ghost’ is the first half of Ghost Rider’s name, it’s not too far of a jump. Granted the title could be alluding to several things within the episode: a possible return from the dead? Someone having gone undercover? But is likely hinting Ghost Rider’s first appearance. So, according to the original article, the showrunner attempted to talk over the fact that magic is basically science in the MCU. He even goes on to say that GR on the show is “some fancy science”. So, magic proper still doesn’t exist in the MCU? Wow, they really painted themselves into a corner, with that whole Thor bit. OMG, did anyone see that AWFUL reveal? Wow, Marvel is really digging in their nether regions for this. Yeah, they’re doing sooo awful on the show you said would only last one season….LOL! That must drive you nuts. He has a hard-on for hating on this show, not sure what his deal is. If he thinks its so terrible I’m not sure why he continues to click on links to do with it.